The back-and-forth began with the far-left Acosta making a national laughingstock of himself (again) with his now famous Twitter report where he accidentally made President Trump’s case for constructing a border wall along our southern border. In what is now being called one of the all-time great self-owns in the history of the Internet, Acosta fired off a tweet that included video of himself at the southern border. “I found some steel slats down on the border. But I don’t see anything resembling a national emergency situation,” he tweeted, as though it proved Trump was lying about a border crisis. The only problem was that Acosta can be seen standing in front of a border wall made from steel slats, exactly the kind of barrier Trump has been calling for in this budget impasse. In other words, Acosta was making Trump’s case — that a border wall works, that there is no crisis where there is a wall. With the whole world laughing at Acosta, including President Trump, Don Jr. joined the fun. 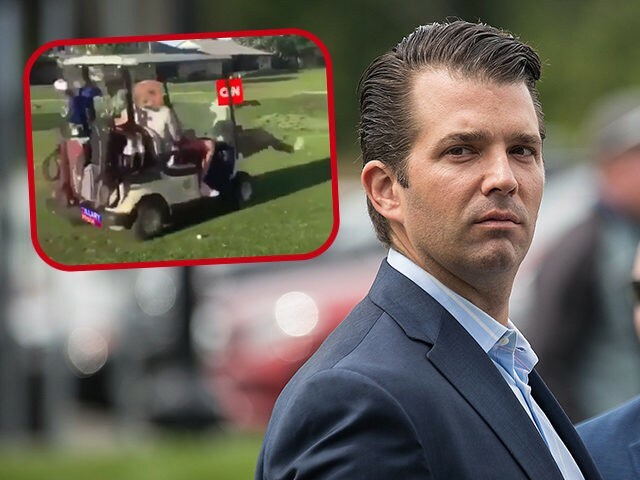 And then Don Jr. retweeted this, a satiric video of a “CNN reporter” getting run over by a golf cart. It should be interesting to see how the gangsters at CNN respond to Don Jr. retweeting that video. When President Trump tweeted out something similar in 2017, CNN lost its ever-loving mind. The far-left network was so freaked out it had its chief cyber-bully, Andrew Kaczynski, hunt down the private citizen who created the video and threaten him with a public doxing if he ever did anything like that again. This was one of those very real and chilling examples of a multinational corporation abusing its power to terrorize its critics.